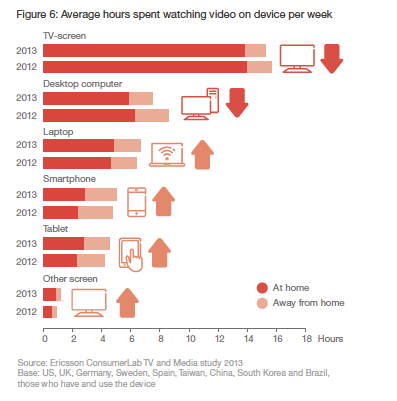 The rapid adoption of smart devices has changed the way we watch video: the majority of the mobile subscribers use their devices to watch video on a weekly basis, which also allows them to stream video content outside their home, according to the latest report scanning consumer trends in the TV area, issued by Ericsson ConsumerLab. 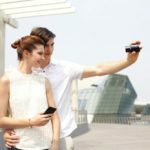 After conducting more than 15,000 online interviews in 15 countries (1,000 per country, which includes Canada, United States, Brazil, China, Germany, Spain, and France) the researchers from Ericsson ConsumerLab found that mobile devices make up an increasing share of TV and viewing, as 72% of the surveyed people use their mobile devices at least one time a week to watch video, and 42% are doing this outside the home. What’s interesting is that even late adopters — meaning 65-69 year olds — are becoming advanced video users. The study points to the 41% of this age group, which studied stream on-demand/time shifted TV, video content including YouTube, and used it more than once a week. The study also sheds light on the increasing use of Video-on-Demand, while the linear TV is more used for sports, events, or other content with “here and now” appeal. Also, User-Generated Content , — how-to guides or product reviews — becomes a very important part of our video consumption habit, with 82% of the surveyed ones using YouTube or similar service at least one time a month.